Rather than focus exclusively on the Minnesota Wild’s top prospects, we’re taking a look at the best players from across the State of Hockey every week. From college to the pros, check out our recap of all the week’s events in Minnesota hockey, as we check in with college players, Wild prospects and State of Hockey alums. Let’s take a look at our three stars of the week in the latest edition of the State of Hockey Tracker. 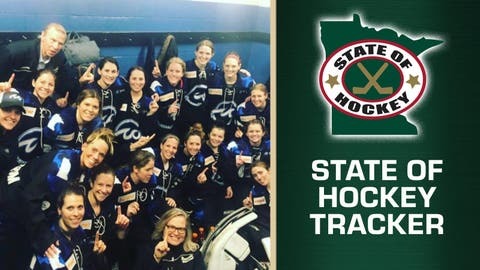 A Burnsville, Minn., native and Minnesota State alum, Barnes scored two goals Sunday — the first of her NWHL career — to help the Whitecaps lock up the NWHL’s regular-season title with a 4-1 win over the Connecticut Whale. The Whitecaps take on the winner of a play-in game between the Whale and the Metropolitan Riveters on Sunday, March 10 in the first round of the five-team Isobel Cup Playoffs. Minnesota closed out its first season in the NWHL with five straight wins. The NCHC’s regular-season champs cruised to another sweep over the weekend, stretching their winning streak to five games with a 5-4, 8-2 sweep at Western Michigan. Lizotte came up big for the Huskies, leading the nation with six points (two goals, four assists) on the weekend. The sophomore had a hand in three of the Huskies’ first four goals Saturday, picking up the primary assist on Jacob Benson’s goal to start the game, then scoring back-to-back goals to push the lead to 4-0 late in the first period and midway through the second. Lodnia, a third-round pick of the Wild in 2017, has picked up right where he left off after missing 25 games with a lower-body injury. A point-per-game player before the injury, the 19-year-old has seven points in five games since returning to the lineup. He scored two goals in his first game back, on Feb. 23, leading Niagara to a 5-0 win over Peterborough. — Senior forward Robby Jackson had a big weekend for SCSU as well, chipping in two goals and three assists against Western Michigan, including the final two goals of a comeback win over the Broncos on Friday. Fellow senior Patrick Newell had two goals and two assists for the Huskies, and now seven points in his last three games. — Sophomore defenseman Mikey Anderson led Minnesota Duluth in points over the weekend and tied for second in the conference with four points, all assists, in a 4-2, 6-5 sweep of Miami. Freshman forward Noah Cates and junior defenseman Nick Wolff each had two goals. — Whitecaps star Kendall Coyne-Schofield hit the afterburners on an empty-net goal to put Connecticut away Sunday, and will join former FOX Sports North reporter Jamie Hersch for an all-women edition of NHL Network’s “NHL Now” on Tuesday, March 5. — The Gophers’ top line of Brent Gates Jr., Rem Pitlick and Tyler Sheehy combined for nine points during the Gophers’ two-game series with Arizona State. The trio helped Minnesota to a 5-1, 5-2 sweep of the Sun Devils on the final weekend of the regular season. Minnesota kicks of the Big Ten tournament with a best-of-three series against Michigan this weekend. — Arizona State defenseman Jacob Wilson will miss the Sun Devils’ first NCAA tournament game should ASU, which currently ranks eighth in the PairWise, make it. The sophomore was assessed a five-minute major penalty and a game disqualification for a dangerous hit on Minnesota freshman Sampo Raanta during Saturday’s game. The only independent in Division I men’s hockey, Arizona State is off until the NCAA tournament begins March 29. — Freshman Dryden McKay and junior Mathias Israelsson allowed just two goals on the weekend, backstopping Minnesota State to a 4-1, 3-1 sweep of Bemidji State. The top-seeded Mavericks host Alabama-Huntsville in the first round of the WCHA tournament, a best-of-three series, this weekend. — Wild prospect Kirill Kaprizov (fifth round, 2015) has an assist in each of CSKA Moscow’s three playoff games thus far. Moscow currently leads Vityaz 3-0 in its best-of-seven series. — Wild prospect Damien Giroux (fifth round, 2018) has been on a run of his own recently. He has three goals and two assists in his last four games for the OHL’s Saginaw Spirit.